RAT Cutlery is now ESEE Knives. ESEE Knives makes all the same models, but by different names that RAT Cutlery used to. 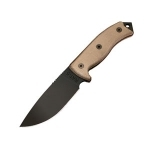 Since they are the same company, ESEE knives are made with the same quality as RAT Cutlery knives were. They are great knives ideal for camping, hiking, backpacking, survival, or any type of high adventure in the wilderness. They have an outstanding warranty as well. Below is a chart showing the best RAT Cutlery knives on the site as reviewed by multiple users. Keep in mind that there are many great RAT Cutlery knives out there, but if you can't decide on one after searching the site, choose one off this list and we are confident that you will be happy!